In the Fort Kochi area there are a few interesting temples and churches. Not far from the Mattancherry palace there is a Jain temple, which at the time of visiting was undergoing restoration. 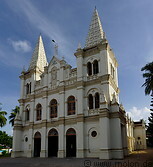 The Santa Cruz basilica was initially built in 1557 by the Portuguese and is one of the oldest churches in India. It was completely restored in the early 20th century. The interior is richly decorated with carved wooden panels. The St Francis church was initially built in 1503 and is the oldest European church in India.